Решение для макаронного производства купить в Алматы. Решение для макаронного производства заказать по выгодной цене - Uni-Tech. Фото, описания, характеристики, отзывы. Доставка по Казахстану. It is possible to produce pasta with any kind of gluten-free raw material (corn, rice, quinoa, etc.). 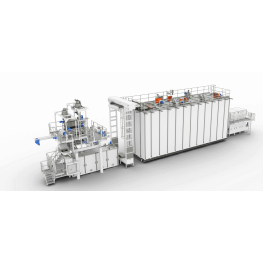 During this phase, thanks to a precise volumetric dosing and to a powerful system of steam injection, the starch contained in the raw material is gelatinized, to be ready for the next forming phase. The raw material, already gelatinized and humidified in the previous phase, is formed in a vacuum tank and then extruded with high efficiency compression screws, necessary to keep the pasta shape, at the exit of the die head. 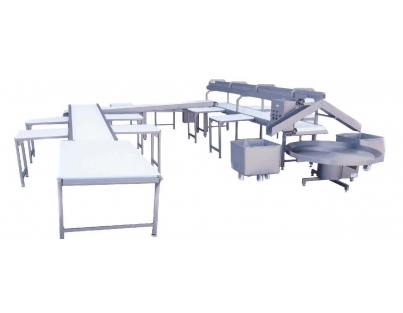 This equipment allows a homogeneous spreading of the Long-Cut Pasta on 2550 mm sticks. 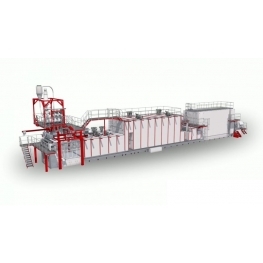 It is provided with an automatic system for fresh scraps recovery and a pneumatic conveying system to the press. The surface of the Long-Cut Pasta is pre-dried, with a continuous hot air flow, to prepare the product for the subsequent drying phase. 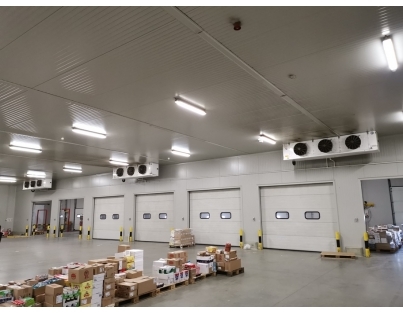 Thanks to MONOTIER technology, a succession of ventilation phases and off phases occurs with the maximum simplicity, completely controlled by automatic systems of thermohygroregulation. The cooler, fitted with a heat exchanger entirely manufactured in stainless steel, allows to lower the temperature of the pasta and make it suitable for storage and / or packaging. 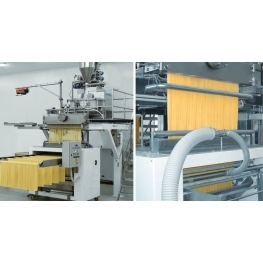 With a storage capacity of approximately 30-35 minutes, the buffer makes possible to store LongCut Pasta on sticks before the stripper, to compensate possible short shutdowns of the packaging system. 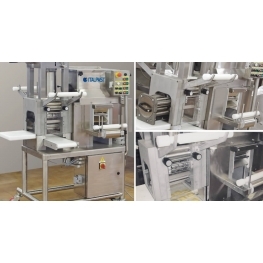 The stripper automatically removes the sticks and cuts the pasta to the length required for the next phase of packaging. ARS (AxorOcrim Remote Service) is the automation and supervision system completely developed by Axor Ocrim. Remote assistance with Axor Ocrim’s technical and support center, available 24 hours / 7 days. The cutting unit is a completely independent unit, fixed at the press legs. It is suitable for cutting any pasta shape and also to fit the “penne” cutter device. The shaker is fitted with a new motion device (patented), which allows a significant energy saving. In the shaker, the surface of the pasta is dried very quickly by hot air, to prevent sticking in next steps of the pasta production process. The complete pasta drying process occurs in two zones of the E.N.A. dryer: the pre-dryer and main dryer, each having separated thermohygroregulation control units. A pre-drying phase of approximately 40 minutes, followed by a drying phase of approximately 2 hours, to end with a stabilization phase of approximately 30 minutes, allows a high-quality production using any kind of raw materials. The E.N.A. dryer is fitted with high density fiberglass panels, internally lined with stainless steel sheets and silicone rubber gaskets. The air/water cooler is fitted with an external cooling unit to lower the pasta temperature and to make it suitable for storage and/or packaging. Axor Ocrim technology combines the tradition of pasta to a new method for preparing it in a natural and healthy way. 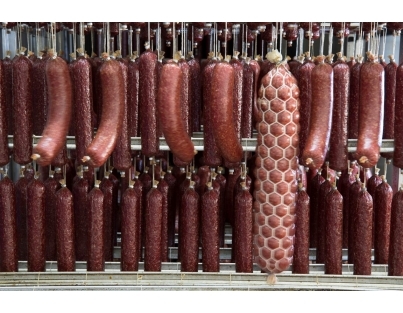 Thanks to a low speed extrusion, a cooking system with extremely controlled steam pression and a homogeneous drying, it is possible to obtain a product which does not need to be cooked but only needs a simply rehydration for approximately 2-3 minutes. 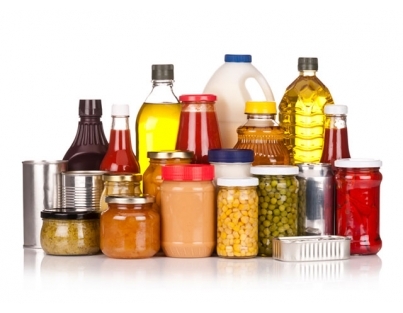 Instant pasta can be combined with different types of sauces and toppings. A good and healthy alternative to the Asiatic noodles that are filled with fat excess, high salt content and artificial flavour. Pasta production process starts here: in the vacuum mixing tank, raw materials and water are dosed, to obtain the dough. Then, thanks to the mechanical action of the high efficiency compression screws, the dough reaches the perfect compactness necessary for pasta to keep its shape at the exit of the die head. Of course, the press is fitted with Total Vacuum System Technology. Pasta drying process starts here. The shaker is fitted with a new motion device (patented), which allows a significant energy saving. In the shaker, the surface of the pasta is dried very quickly by hot air, to prevent sticking in next steps of the pasta production process. This piece of equipment is provided with a new low-pressure steam spreading system, to ensure a uniform and deep cooking of instant pasta. 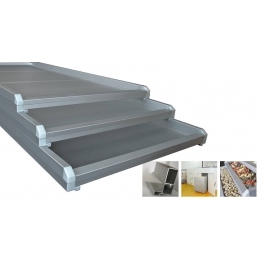 The conveyor belt of the steam cooker is manufactured in self-cleaning PIK, perfect for high temperature. Couscous: an agglomerated and precooked durum semolina-based product but also produced with soft wheat and / or hard wheat semolina. This type of product comes from the north of Africa (Maghreb region), a fast-growing reality in the world, and it is becoming a staple food like pasta, rice or potatoes, thanks to its easy preparation. It does not need to be cooked and is prepared in 5 minutes by simple rehydration. 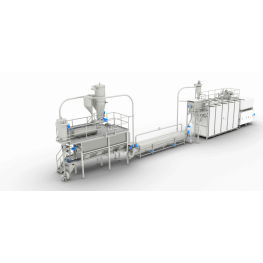 A specific semolina and water dosing system, combined with the action of the new TURBOMIX high speed mixer, allows the making of a homogenous moist dough, which is ready for the next phase of selection of the couscous dimension (fine, medium and large). The selection of the desired type of couscous (fine, medium and large) happens in the rotary selector. The new design of quick-change sieving meshes, entirely manufactured in stainless steel, together with an internal movement of the couscous with spiral motion, guarantee a perfect selection. The steam cooker is provided with a new low-pressure steam spreading system, to ensure a uniform and deep cooking of the couscous. The conveyor belt of the steam cooker is manufactured in self-cleaning PIK, perfect for high temperature. The rotary sieve prevents sticking/outsized couscous grains from reaching the dryer. Completely manufactured in stainless steel with interchangeable meshes, this device transfers to the regrinding system the grains of couscous that do not meet the standards, without any losses of products or scraps. The mechanical movement of the central shaft of the rotary dryer allows a controlled rotation of the drum, therefore producing an effective ventilation in every single zone. The drum rotation allows a continuous movement of the product inside the dryer, ensuring a perfect homogeneity of the moist products, which is a key requirement for couscous production. L.P.S. 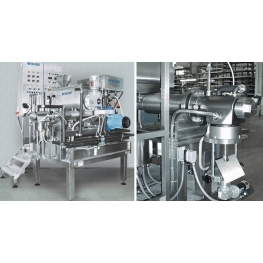 Special-Shaped Pasta Line: the concept of production flexibility exalted to the highest level. The combination between T.V.S. 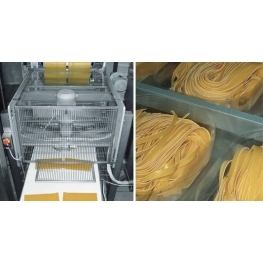 press (Total Vacuum System) and the pasta movement on trays allows the production of any kind of special pasta shapes such as round nest, oval nest, lasagna, matasse, big size Short-Cut Pasta shapes, cannelloni, “farfalle” and so on, without any risk of breaking or damaging the pasta product. The most important features of this equipment are the TURBOMIX technology and the low-speed of extrusion, which is achieved thanks to the high-efficiency compression screws: these characteristics allow to obtain a very homogenous dough. The press can be fitted either with Total Vacuum System or with traditional technology. 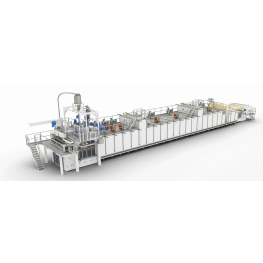 Through the forming machine, the laminated pasta sheets or otherwise the extruded pasta take the desired shape (nest, matasse, lasagna, etc.) 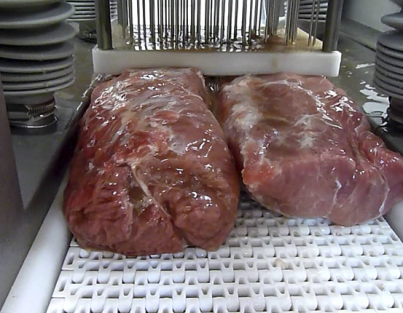 for the subsequent spreading on trays. Thanks to a powerful ventilation, the surface of the Special Shaped Pasta is heated to maintain the desired shape, prevent sticking and to prepare the product for the subsequent vertical predrying phase. This phase of approximately 50 minutes, performs a quick heating of pasta and the preparation for the next drying phase. 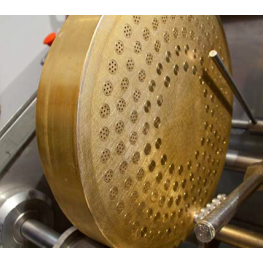 Thanks to a rising/descending trays movement inside the main dryer and to a sophisticated thermohygroregulation system, different for each phase, it is possible to obtain a perfect drying and stabilization of any kind of Special Pasta Shape. Provided with a heat exchanger entirely manufactured in stainless steel installed in a dedicated external unit, the cooler allows to cool Special Shaped Pasta and to prepare the pasta for the next packaging phase. 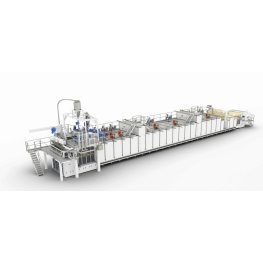 There are different models of emptying devices: it is possible to flip the tray to obtain a bulk packing or there is the possibility to have an unloading unit with pieces counting and tidy feeding of the packaging system. 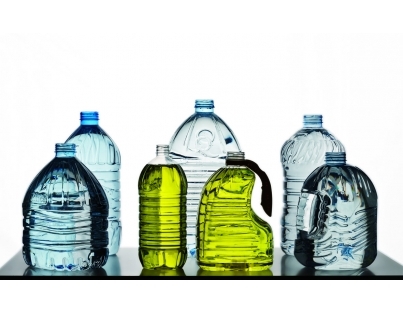 The best balance between technology, easiness and production/maintenance costs saving. The T.V.S. 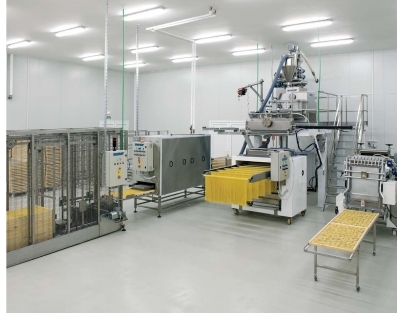 press (Total Vacuum System) and the use of high temperatures allow to achieve excellent quality pasta despite the use of poor quality raw material. The most important features of this equipment are the TURBOMIX technology and the low-speed of extrusion, which is achieved thanks to the high-efficiency compression screws: these characteristics allow to obtain a very homogenous dough. The press can be fitted either with Total Vacuum System or traditional technology. Thanks to the MONOTIER technology, a succession of ventilation phases and off phases occurs with the maximum simplicity, completely controlled by automatic systems of thermohygroregulation. 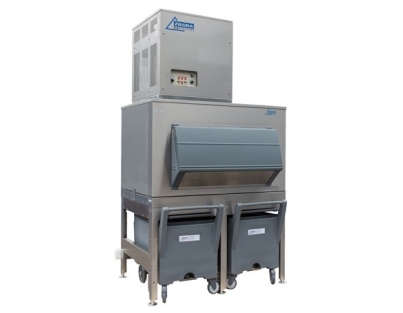 The cooler, which features an heat exchanger entirely made of stainless steel, allows to lower the temperature of Long-Cut Pasta and make it suitable for storage and / or packaging. Axor Ocrim has combined the tradition of the double racks for the sticks movement to the new Thermal Inversion Technology (T.I. Technology), giving the chance to choose between TVS technology press (Total Vacuum press) and the traditional press, reinforced aluminum sticks and, finally, the perfect mechanical movement of the double racks. 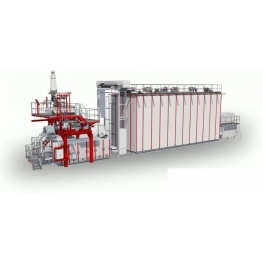 A permanent and homogeneous drying of Long-Cut Pasta is permitted by the switching from ventilation phases to rest phases, which are totally controlled by automatic thermohygroregulation systems and are combined with a mechanical double rack guide. 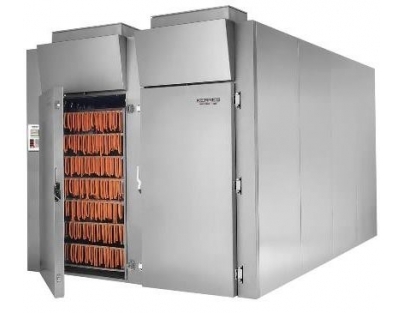 Provided with a heat exchanger entirely manufactured in stainless steel, the cooler allows to cool Long-Cut Pasta and to prepare the pasta for the next storing and packaging phase. During the night shift of production, it is possible to collect the Long-Cut Pasta on sticks. 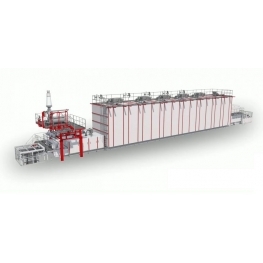 Every tier has an independent motorization to synchronise the loading and unloading of the storage silo, through an automation system devoted to this equipment. The technology developed by Axor Ocrim allows to use any type of raw material. 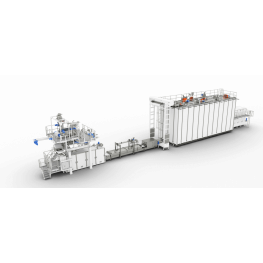 Thanks to the vacuum press, the new generation energy saving shaker (patented) and the high temperature dryer, it is possible to produce an excellent pasta, even using soft wheat flour. Pasta production process starts here: in the vacuum mixing tank, raw materials and water are dosed, to obtain the dough. Then, thanks to the mechanical action of the high efficiency compression screws, the dough reaches the perfect compactness that is necessary for pasta to keep its shape at the exit of the die head. The press can be fitted either with Total Vacuum System or with traditional technology. Pasta drying process starts here. The shaker is fitted with a new motion device (patented), which allows a significant energy saving. In the shaker, the surface of the pasta is dried very quickly by hot air, to prevent sticking in the next steps of the pasta production process.